Way, way, WAY back when I was pregnant with Julia and I had just finished my first and last year of teaching I don't remember how but I stumbled upon Kayla's blog. I didn't know there was such a thing as blog analytics and now that I do I cringe at how she must've scratched her head over how many times a Wichita, Kansas creeper visited her blog. I couldn't help but comb her archives and hope and pray she'd put up a new post that day. I blame my nearly sinful amounts of free time but it was also my first real look at the fascinating world blogging and I was totally hooked. I would be lying if I said my blog wasn't pathetically fashioned after hers in the early days. If then Grace had known that now Grace would be friends (well, I consider us friends - she might consider me a charity case) with Kayla ... she would never have believed it. Ever. Anyway, I'm not sure that's enough back story. I can go on! I won't - but I could. The bottom line is that I've been a huge Kayla fan for a long time. Some of my favorite posts she did were her sewing projects (and if you've read far back enough you know that I predictably copied that hobby of hers as well) because she's really talented and has a unique eye for liveable but on trend fashion. So, you can imagine my excitement when she told me she was starting a skirt company because I knew that she'd design some really great skirts ... which SHE DID. Lark Skirt's first collection is so fun and pretty and well thought out because all of the skirts have nice deep pockets (hello phone/key storage), are lightweight but not see through (this is huge), and are a really great length. The back of the waistband is elastic so it's really comfortable while the front has a nice clean and tailored look. 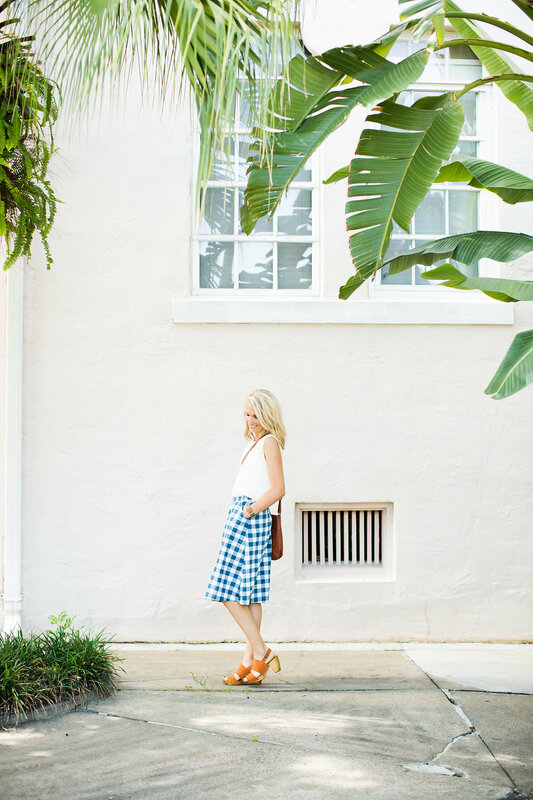 While of course anyone can wear a Lark Skirt, Kayla is a mom and she designed the skirt with moms in mind: prints that hide grubby hand prints, a play-friendly length, and all breathable cotton that is comfortable even in the most hot and humid of climates. I'm wearing the blue buffalo check but I think my close second favorite would be the green floral. All of her skirts are handmade and have the option of either patch or inset pockets (mine are inset - if that isn't obvious) and they are all (I don't use this word often or lightly) fabulous. Kayla is VERY generously giving a skirt of your choice away to one lucky reader ... just follow the Rafflecopter instructions and I'll bide you farewell and best of LUCK!!! Thank you! I love the length of these skirts. Thank you for posting! 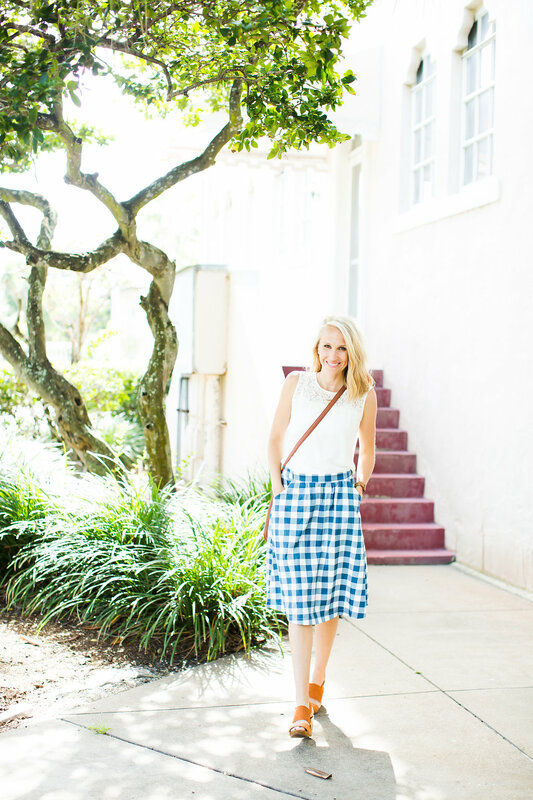 my favorite print is the gingham! The green floral skirt is *stunning*! Oh my goodness that skirt is so cute! I love the pattern, pockets, and the length! Oh my goshhhh. Those skirts are dreamy. The feather print! I have been looking for skirts just like this! Thanks for sharing! The white floral is my favorite! Although I am so thrilled to be pregnant for the first time I canNOT wait to be unpregnant so that I can wear fun skirts again that don't make me look like I'm smuggling a watermelon! I'm torn between the white floral and the blue feather. I love a classic knee length skirt...so feminine and flattering. Love the red geometric! As a teacher, I'm always hunting for cute, comfy, and modest clothes. Loving the white floral print! So feminine and pretty!! Beautiful skirts! I agree, the green floral is awesome! Love the white floral print. So cute. Oh the cuteness. I love them! Lets have one of each please. Love the green floral, beautiful! Blue buffalo is my pick, or the white floral! The green floral is the perfect gift for my mother in law's birthday too! Floral for fall is in! :) Great company. Love these!!! Green floral is a total winner. The green floral is a total winner! Kayla IS pretty amazing. As for her skirt line, I am totally digging the feather print. Green floral and gingham are my favorites too. Love them all! You look so beautiful in yours! I like the white floral best but they are all very pretty. I LOVE LOVE LOVE the pink sailboats! and the white floral is a pretty close second! Yes, please! I want one. Very cute! The feather print is my fave. I love the Pink Sailboats! White Floral! Green Floral! Buffalo Check! Who could ever choose?! I love the photo of the floral paired with a check top, that is so cute! Love Kayla, love the skirts. I love, love the blue buffalo check! I love the vintage vibe of the green floral, so cute! I love the green floral! oh the white floral is SO pretty! but i also like the red geometric for fall..... hashtag decisions! So cute, I like them all! I like the blue buffalo check too! The white floral is so pretty! I'm jonesing after that white floral! Adorable! The white floral is my favorite. Love the skirts - could totally use these for work! so.many.choices. Love the colors and patterns oh my!! lovely. White floral please! So lovely! Either the blue buffalo check you have or the white floral! I LOVE the white floral! Just adorable! 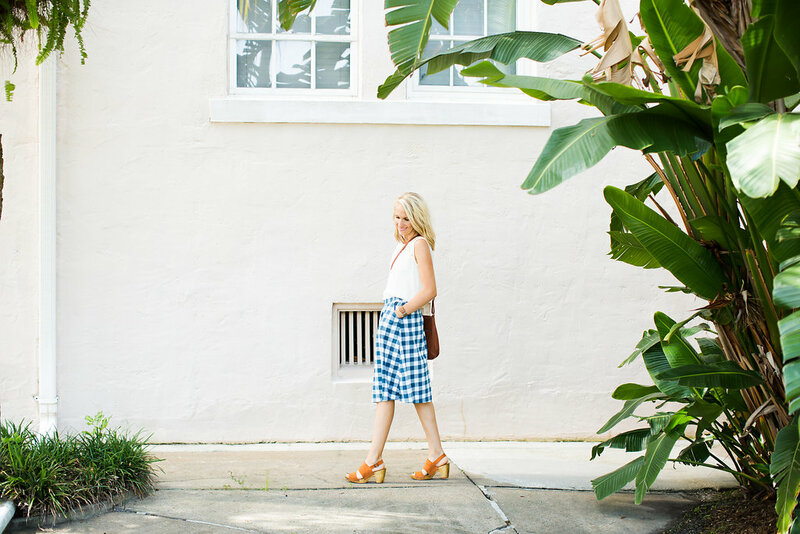 Love the gingham! basically, i need that. because breastfeeding friendly clothes are hard to find. and that skirt is way cute. NEEEED. and my husband's PGY4 so...really need a pick me up. The white floral is so pretty! And versatile-lots of options for a top! Um these are adorable! One of each, please. I think I need that green floral. Or the boats. Or feathers. Gah! Love the pink sailboats one!! I love the green floral, but they are all really cute. These are all so adorable but I really love the green floral. They seem like a great length, I have a hard time finding work appropriate skirts. Mmmm the buffalo plaid or the feather print!! Yay! So glad to find another place with cute and modest skirts! As a teacher, the pockets are a definite plus! I love these skirts! I was so excited when I saw Kayla was starting Lark. And I think the red geometric is my fav. My favorite is the white floral! I haven't owned a skirt in ages, but the blue feather print is tempting! I would go for the white floral! The Buffalo check is my favorite! yess!!! i love the white floral. The green floral is dreamy. I'll get the white floral if I win! You look great, Grace! probably blue buffalo or white floral. Beautiful, practical skirts. And such a nice selection of patterns. My favorite is the blue buffalo check, with the green floral as a close second. I rarely wear red but surprisingly love the red geometric. Can't decide between the green floral and the blue feathers; so pretty! And pockets!!! I believe my favorite is the blue buffalo check also. Next would be the feather print. You look great in yours, of course!!! So cute! I love the feather print. Love the green floral and the feathers! I love feather print....or white floral....or blue buffalo...really there are so many options! Buffalo check! Also these skirts look long, super helpful for this 6-1 lady. I love the white floral skirt! The white floral is my favorite! WHite FLoral all of the way! Mom appropriate, comfortable yet still stylish?! A wining combination! I stumbled on her blog too and loved it, but not for her craftiness or style, for her incredible humor and wit! We are real life friends too and her skirts are gorgeous! I really love the feather print! I love skirts, and I'm always looking for ones with big pockets that aren't too short. These Lark skirts are perfect. Thanks for sharing. I love the yellow and blue paisley skirt! These skirts are gorgeous and the perfect length. Speaking of length, I like your new hair length, Grace!! I LOVE that white floral print! So pretty! I like the blue buffalo skirt. Thanks for the giveaway! Love a skirt length that allows you to bend down to a child without mooning everyone at Target! I got the blue feather skirt, but that gingham was a close second. This pics are giving me real skirt envy. Um these are new-ish mom perfection! I LOVE the green floral!! I think I like the red geometric. But they are all adorable! I love the white floral. These skirts look amazing! Cute! I want one! I'd pick the white floral or the buffalo check. I love blue buffalo and white floral. So pretty and feminine! Green floral, but feathers is a close second! These are great. So pretty! I love skirts...so fun and easy and you end up looking like you have it together. It would be a tough choice between the feather print and the white floral. I love pink sailboats, ir the white floral! Pink sailboats or green floral, love the prints! Love the white floral and the Buffalo print!! So pretty. I really like the white floral but they are all great. Skirts are so fun! That blue buffalo check is fabulous! Pockets!! And as a tall woman, I love that they are a longer length so I can still wear them and not flash everyone when I bend over to pick up my kids!! White floral, but really, I'd take one of each. Oh yes! That blue buffalo check! What a cute pattern for so many seasons!! And I agree, the green floral is a close second. Gorgeous, gorgeous! Exclamations abound!! I love the feather print skirt! Ah!!! I love these and I'm SO picky about skirts. I love the green floral too. 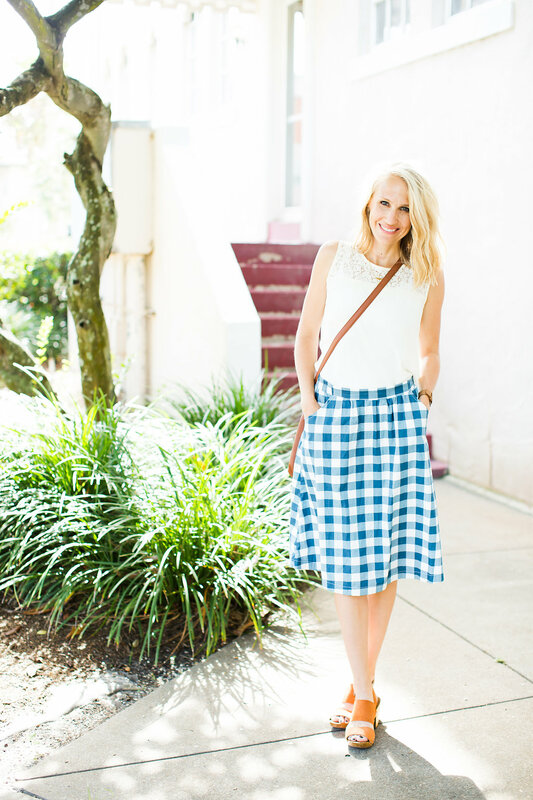 Love these skirts and love kayla's blog! Absolutely love the blue/white gingham!! Toss up between feather and green floral!! Seriously can't make up my mind!! Green floral, but all are so pretty!! I need the blue and white gingham in my life. Love these, perfect for those of us who shun shorts! The white floral is my favorite! I will show her shirts to a friend who has lots of children and would love these! Oooh that white floral! Dreaming now. These are gorgeous! My favorite is white floral! It is so feminine, and a breath of fresh air! I'm ridiculously torn between the white and green floral, but then I really like the pink sailboats. So, all of them? Love the pink sail boats print! Gorgeous, absolutely beautiful! Even if I don't win, I am hooked! Thanks Grace!! And Kayla!!! The gingham print is so cute! The skirts are all so cute- it's hard to choose just one! But if I had to choose, it would would be the white floral print. Thank you for the giveaway, Lark and Grace! Stumbled on her blog years ago, as well, and the sewing, healthy recipes and Arrested Development references definitely had me creeping too often for someone who never met her in real life. :) Lovin' the skirts, and think the sailboat with inset pockets is my fave! Love her skirts! That white floral is too adorable. Love these skirts and think I could make one work with my growing bump. I like the white floral! Finding skirts that aren't too short is such a challenge for a 6'er. Love all of the skirts, but my favorite would probably have to be the white floral. All so beautiful! Wear a skirt erraday and always always always on the look out for ones that are postpartum belly friendly (...ahem) and not see through! These are rad. These are adorable! I love the white floral. White floral - do they come in petite? So in love with the feather print! Love the buffalo check with inset pockets! These are great! I'm torn between buffalo check and the red. I'm a tall-ish girl and mid-length skirts are hard to come by! I like the white floral the best. I love the white floral, but the pink sailboats is a very close second. They are all so cute! Also love the white floral!